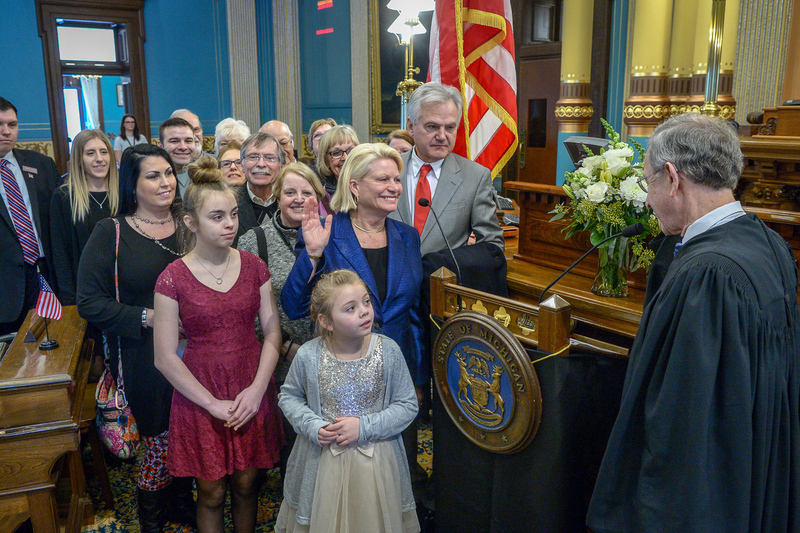 LANSING, Mich. — Sen. Ruth Johnson, R-Holly, was sworn in as senator for the 14th District on Wednesday during a ceremony at the state Capitol. Michigan Supreme Court Chief Justice Stephen J. Markman administered the oath of office. Johnson was joined on the Senate floor for the oath by Robert DePalma; Pam Mazich; Donn Hinds; Ed and Marilyn Macadeg; Chris Maniaci; Matt and Wendy Smith; Laura Toy; Susan Nash; Julie Ogg; and Luke, Brianna, Alexia and Mariah Markell. Editor’s note:The above photograph of Johnson is available by clicking on the image or by visiting www.SenatorRuthJohnson.com/photos/. Video of the ceremony is available at www.SenatorRuthJohnson.com/video/.